After getting Mimiron down last week, our eyes quickly fixed on General Vezax. But we know that we still have some issues with the Keepers, and they take a while to get down, so we might not really see him until we’ve been able to master those fights! So we pushed through Flame Leviathan +1, XT-002, Kologarn and Auriaya in our first night. We’ve been having issues with Thorim, and even thought we got Mimiron down last week, we never quite got Thorim. Well, this week wasn’t looking much better… Thorim’s disconnect roulette, combined with some other various connection issues presented too much for us, and we were forced to retreat to the Assembly of Iron and Ignis. Wednesday night we went in with a plan: Mimiron first. Tired of dealing with Thorim, we wanted to see if we could get him down a second time… and we did! In fact, we ONE-SHOTTED him! Huzzah! And more importantly, we got Thorim down! It took us 3 or 4 tries, but we did it. I think we’ve improved on some things, and I look forward to next week to see how we do again. Took out the other keepers, and by the second half of Thursday night’s raid, we were face to face with General Vezax. After his brutal and annoying no-pets-allowed trash, we were finally ready to give it a go! And it was no where near as bad as I thought it would be… at least for me I wouldn’t want to be a healer or even a true caster in that fight! But we seemed to get pretty good after our first couple tries, and got him to 28% at our best. I think if we speed up our trash-killing, we’ll be able to get him down next week… and then it’s on to YOGG! Wow, I can’t believe we’re finally nearly the last boss! I’m so excited, I hear that fight is quite fun. Oh! And happy July 4th to everyone in the U.S.A.! Hope your holiday is great! While I’ll go a bit more into this week’s Freya attempts in my “This Week in Raiding” post tomorrow, I just wanted to point out this one thing I found quite helpful during the fight. I know mana is supposed to be a non-issue during 25-mans. That’s never held true for me, at all. I run out of mana in no time, and I almost always have to switch to Viper more than once each boss fight. Freya is a looong fight. Six waves of adds before you can even touch her! That’s a lot of mana to be using. Assuming you are getting to the level of play where you have a chance at getting Freya down, there’s no doubt that you usually have a few seconds between each wave of adds. You could spend this time trying to pad the damage meters by giving it to Freya hard, but I recommend this: Shoot off a Viper Sting at her, and if you’re a Marksman, a Chimera Shot as well. That’s 24% of your mana back right there (plus an additional >15% if you use Chimera). It’s as good as the ol’ Feign Death and drink tactic! In fact, feel free to use 1 GCD to lop a Viper Sting her direction whenever it’s off cooldown and you’re running low. Viper Sting is on a 15 second cooldown, and I doubt you’ll need to use it THAT often. The special thing about this fight is that Freya isn’t your main target, so you won’t be losing DPS by putting Viper Sting instead of Serpent Sting up like on most other fights: You can maintain your Serpent Sting on your main focus while the mana just drains away on Freya! Of course I’d recommend saving your Chimera Shot for real DPS while there are adds active, and only hit her with it when you’ve got down time… but 24% is still an incredible boost. This whole idea might have been obvious to everyone… but I just thought I’d point it out to those who may have forgotten about this little gem. So instead of swapping to Aspect of the Viper, pop a Viper Sting (+ Chimera Shot) . You won’t lose much, if any DPS because Freya is essentially invulnerable during the add phase! It was a holiday yesterday up here in the North, and I decided to take the day and see how far I could get my beloved Paladin. He was all set with his Charger at level 61, ready to head to Northrend to slay demons and red Orcs. After about 10 hours of playing yesterday, I managed to go from 61 to 64. That’s practically halfway done Outlands! In a day! Hah! I even picked up dual specs, he’s my very first character to specialize. I made up a prot spec for his secondary talents and tried to learn what it’s like to tank as a paladin. I haven’t had a chance to try yet, but I’m looking forward to it. I did want to try some instancing though. So I jumped into LFG while questing, and hoped for the best. I get a few “u healz?” whispers, which I promptly answered no to. Then I got an invite. Ramps PUG attempt #1: 2 Death Knights, a Rogue, a 64 feral Druid, and me (62 Ret/Prot). Group Leader DK asks me if I’m a healer. I say no, I’m ret/prot. 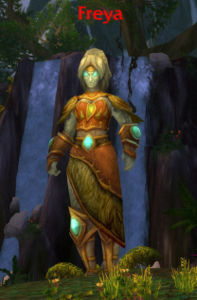 Druid pipes up and says she can heal, she is our most viable option for healing and doesn’t mind doing it even though it’s not her main spec. Sounds good to me! “Who’s tanking?” I ask. “I’m not, DUH, I’m BLOOD I don’t tank” says Group Leader DK (this is the same guy who insists on a ret paladin healing). I volunteer, since it’s my second spec. “Ghugh you are HEALING.” he says. /facepalm. The druid and I both say that she’s volunteered and is a better option to heal. Ramps PUG Attempt #2: 3 Death Knights, a DPS Warrior and me. “We need a healer” says DPS warrior. I tell them it’s not my spec, but I put my healing gear on and seem to heal effectively enough for a Ramps run, and the tank is 64 so that should help. We start running off towards Ramps. A couple of us fail to make a jump and end up splattered on the ground underneath Ramps. We all have a good laugh, blame Crusader Aura and start the run back to our bodies. DK #1 has left the group. DPS Warrior has left the group. OKAY! Looks like we’re done here. Back to questing. I get a whisper from a healer. He invites me to a ramps group as DPS, says he has a tank already. That’s a good sign! We pull a group together quickly. Ramps PUG Attempt #3: 1 Death Knight, 1 Feral Druid, 1 Holy Priest, 1 Elemental Shaman and me. We made it into the instance. This is a good sign. We pull the first group – this is the furthest any of my PUGs have gotten. Good sign! We make it through the run with no Deaths. Huzzah! Success! I can’t say it was a perfect run, but it was something. We all agree to go again. This is where the problems started. I believe the healer and tank began to get a bit cocky. “Just chain pull” says the level 59 healer. “Just pull the entire room” hears the 61 DK tank. I started noticing a strange behavior. The DK was just… standing there. Tanking. He used some abilities, but he was NOT auto-attacking. I target his target – it seems he’s always got whatever mob is BEHIND him targeted. Man, DKs must be so easy to play if you can tank without even facing your target! Things got worse and worse – after a wipe, he pulls before the healer is even into the zone. He pulls when no one has mana. He facepulls and lets the ele shaman and I try to pull the adds off of the healer. We get to Nazan… make it through the Rider’s phase pretty smoothly, but then everyone forgets the “don’t stand in the flames” rule. Priest gos down, Shaman goes down, Druid goes down. It’s just me, the DK and the Dragon now. My eyes look towards the very close instance exit and I contemplate making a run for it. But no – I’m at nearly full health and mana, I can do this! Holy Light! Judgement of Wisdom! Holy Light! Judgement of Wisdom! Luckily I’m regenning enough mana with my Judgements to afford my big heals. It’s a long fight, but we take him down. Just the two of us. Ramps PUG Attempt #3: SUCCESS! There is an inverse correlation between the number of Death Knights in a PUG and the success of the PUG.